Technology is a huge component of orthodontics. Everything from imaging to appliances requires the presence of technology in some form or another. That’s why it’s no surprise that orthodontics has taken a swan dive right into the world of 3D printing! Invented in the 1980s, 3D printing was originally intended for prototypes. It didn’t take long for people to recognize the manufacturing capability of this new tech. This printing process turns digital models into real-life ones by laying material. Think of it like an intricate lego structure. Each layer, or building block, is made from the same material. These pieces are laid one on the other until the model, or structure, is complete. At the same time 3D printing was popularized as a manufacturing technique, the orthodontic industry had a shift of its own. With the change in focus from braces to aligners, manufacturers and orthodontists alike were looking for inexpensive ways to build accurate plastic appliances for treatment. 3D printing and clear teeth aligners became a match made in orthodontic heaven. Today, one of the largest 3D printing production facilities in the United States is dedicated to printing clear teeth aligners. Companies manufacturing clear aligners are continuously improving their materials to find the best fit. Align Technology, the parent company of Invisalign, patented their own SmartTrack material used to print Invisalign. The vast majority of “ink” material is made out of some kind of thermoplastic, which is what allows it to be 3D printed into the arch shape. Materials also need to be stain resistant and perfectly clear to be considered plastic aligner worthy. Orthodontics is one of the industries where 3D printing has been the most useful. 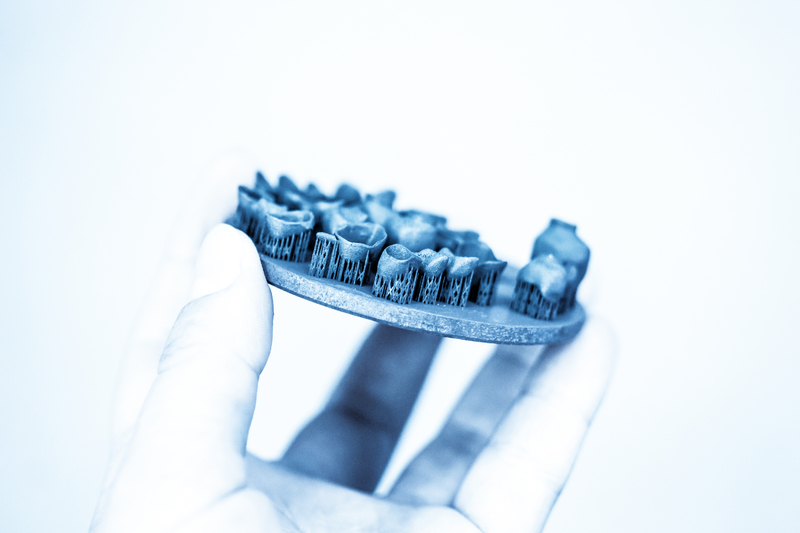 The cost effective and highly detailed components makes 3D printing a no-brainer for any company producing clear aligners. Contact us today to find out how Invisalign, and the amazing technology behind it, might be the perfect solution for you!